Simon & Schuster, 9781451627459, 336pp. THE CONCUSSION CRISIS brings an explosive but largely unseen epidemic out of the shadows. It puts a human face on a pressing public health crisis through poignant stories of athletes (from the peewees to the pros), soldiers, and others whose lives have been forever changed by jolts to the head and brain. 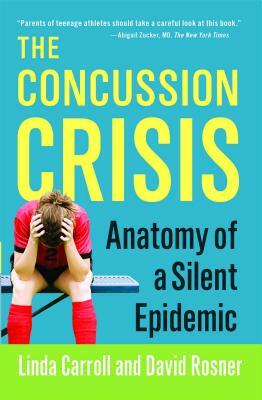 Weaving their cautionary tales with a clear and accessible explanation of the advancing science and medicine, The Concussion Crisis is the definitive exploration of the invisible injury behind today’s alarming headlines. Journalists Linda Carroll and David Rosner sound an urgent wake-up call to every family and argue for changing a macho culture that refuses to treat concussion seriously as the traumatic brain injury it is. For three decades, David Rosner has worked as a sportswriter at major metro newspapers and national magazines. As an award-winning staff writer at Newsday in New York, he spent twelve years covering the full gamut of pro sports—including horse racing. He has covered racing since the spring of ’77 when his first bylined stories as a cub reporter chronicled the harrowing Belmont spill that hospitalized the teen sensation Steve Cauthen. Rosner earned national Associated Press Sports Editors Association awards for investigative reporting and for deadline writing as well as New York State AP and UPI awards for enterprise journalism. He also served as editor-in-chief of the national hockey magazine Rinkside and coauthored The Official Illustrated NHL History.